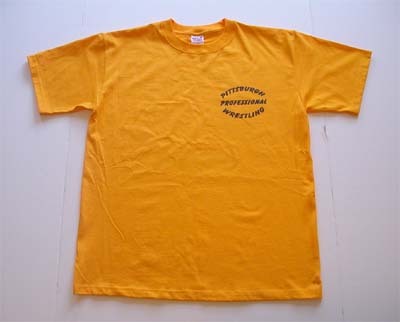 "Golden Tee" - A gold 100% cotten shirt with black print features "PITTSBURGH PROFESSIONAL WRESTLING" on the front and the PGH PRO logo on the back. Available in the following sizes: Medium, Large, XL. PGH PRO's inaugural show features a former WWE Superstar, a hard fought Championship Contest, a brutal Grudge Match, highflying tag team action, a Special Challenge, and much more! Plus commentary by The Orangutan & The Viceroy! Only $5 (plus $3 shipping). To order email sjgyouthmin@yahoo.com! PGH PRO returned to McKees Rocks for "Norwood Knockdown!" 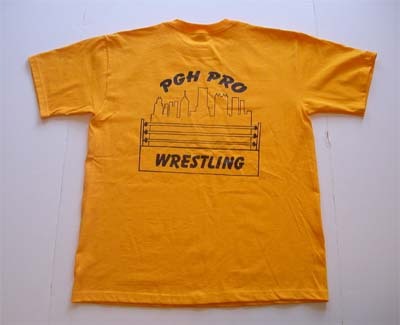 The show features Pittsburgh's own "Living Legend," a Hometown Challenge, a 3-Way Dance, Tag Team Action, and much more! 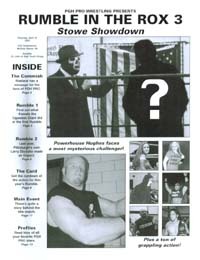 PGH PRO Wrestling invaded McKees Rocks for "Stowe Showdown!" The show features a women's match, the historic crowning of a new PGH PRO Champion, and the fate of the Parts Unknown Posse plus much more! Only $10 (plus $3 shipping). To order email sjgyouthmin@yahoo.com! The official publication of PGH PRO is packed with articles, wrestler profiles, results, and lots more fun and interesting info! Order your copies today by emailing sjgyouthmin@yahoo.com!